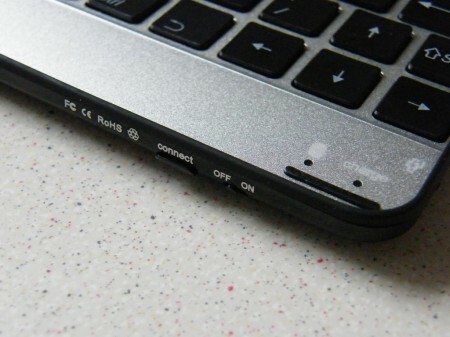 The other week we published our initial impressions of the Gemini JoyTAB with bluetooth keyboard. Things looked good apart from a few ill placed logos. I’ve been using it for a few weeks now and it’s time to bring you the full review. The JoyTAB is made entirely of metal, I’m guessing it’s Aluminium, being made of metal brings about two things, firstly it’s nice and solid, with no flex or creaking. Secondly it makes it quite heavy. Nothing ludicrous here as it weighs about the same as my Transformer Prime. 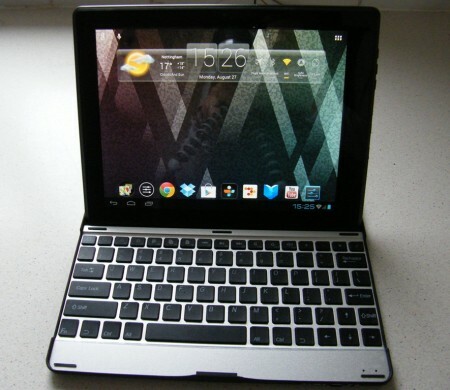 Oops I mentioned my Transformer Prime, throughout my time with the JoyTAB I keep comparing them. Which is a bit unfair when you look at the price. 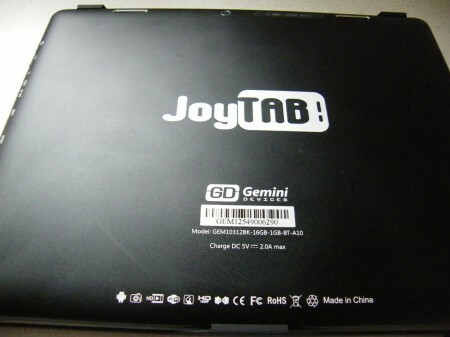 The JoyTAB GEM10312BK currently costs about £200. 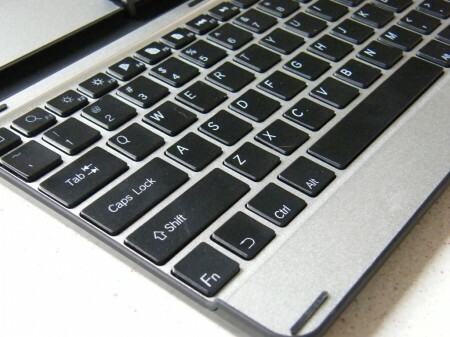 The keyboard also has a few special buttons, for media playback, volume adjustment, back, home, search, cut, copy and paste. Having these makes the keyboard quite useful and speeds up document creation. There is also buttons to adjust the brightness which don’t work. 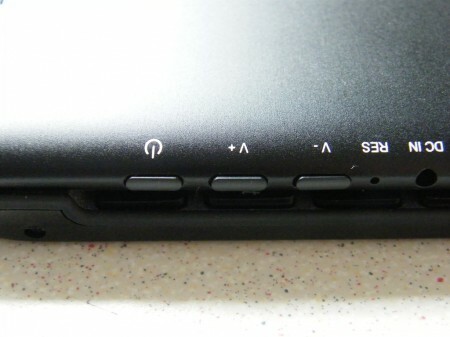 The tablet itself has the same power connector, a mini usb for pc connection, a micro sd slot, volume and power controls, in the box there is a USB host cable to allow you to connect USB devices and the tablet has mini hdmi connector although no cable is included. 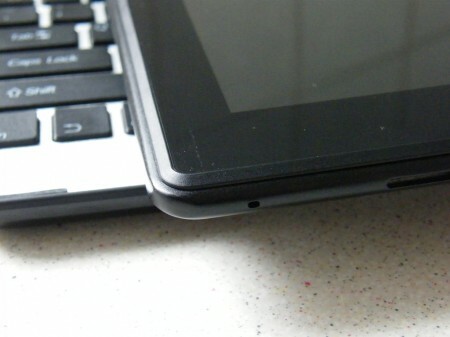 So you’re well connected with this tablet. 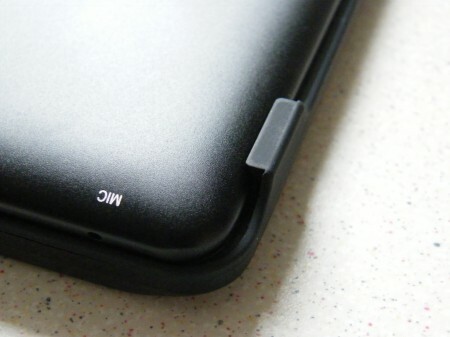 The whole tablet and keyboard case are covered in matte black paint which has a very slight texture to it, which is nice to hold but is ruined by the top and bottom of the tablet and keyboard being covered with Gemini logos. Nothing too important here, I just feel it detracts slightly from the overall look. 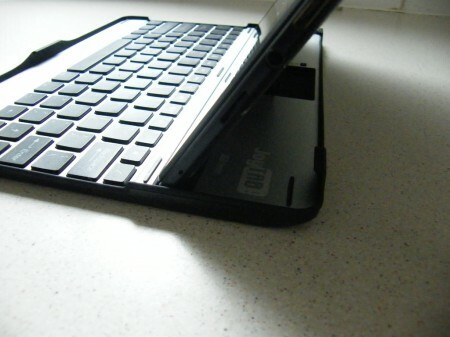 The keyboard does also act as a protective case for the tablet. 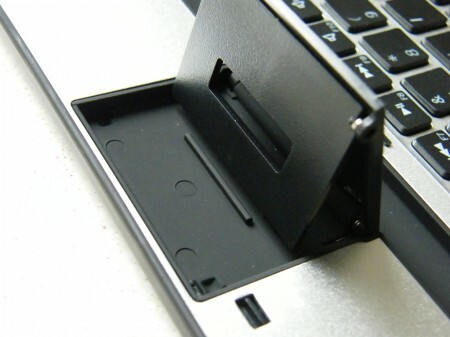 Which is a nice touch, although the clips and the raised edge that hold it together at times get in the way. You need to raise your wrists a bit to type. Spec wise the JoyTAB is lower than some of their other models, which isn’t a bad things as they were obviously targeting a price point with this model. Some good and bad points here. 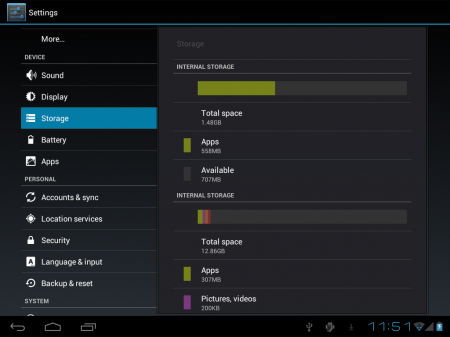 The internal storage is nicely done allowing you to install plenty of apps and games and still have space for your documents. 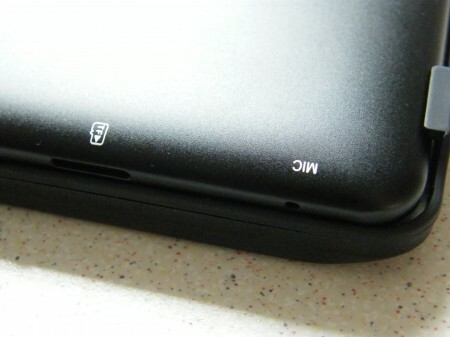 The Micro SD slot means you can load it up with music and videos to take out and about with you. 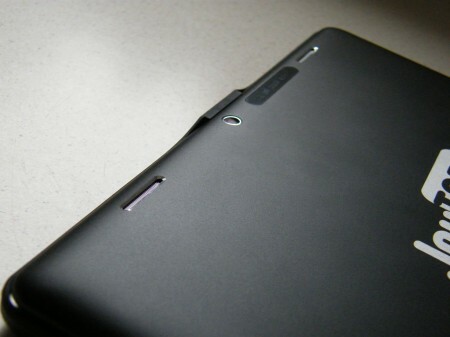 Another good thing is the IPS display which made for great viewing angles. Although the slightly low resolution meant reading or text was a little blurry once zoomed in all of the way. The bad points are the single core cpu which at times gets a little bogged down, installing app updates is a prime example. Another slight annoyance is the wifi, as it’s only b/g those of you who are used to b/g/n are going to notice the speed difference. Again installing ap updates gobbles up all of your bandwidth. Benchmark wise the JoyTAB scores fairly low, with an AnTuTu score of 3076 (with a Transformer Prime scoring around 10,000) which puts it on a par with things like the Nexus S and the Galaxy S. Back in the real world I only really noticed any delay when installing group app updates in the Play Store and when you have a lot of apps running in the background. I was pleasantly surprised to see the JoyTAB running Ice Cream Sandwich, which is really the standard for new tablets these days. It meant I could use various ICS only apps, like the Chrome browser. Gemini have barely messed with the Android experience at all, it is basically stock Android, only the gallery and an ebook app appear any different. Another nice thing is that the tablet is Google licensed, meaning you get the Play Store and all of the goodness that comes with that. 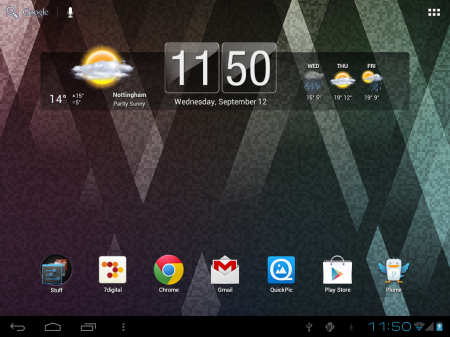 I tried out a few other launchers with the JoyTAB and Apex and Chameleon both worked without much hassle. One thing that Android sometimes get a little confused with is bluetooth keyboards, with this keyboard it got a little confused as well. Using the standard keys 99 times out of a 100 they work, that 1 time you get a slight delay whilst bluetooth catches up. Another slight bug is alternate functions on the number keys, the “_” button wouldn’t work. Upon further investigation the stock Android keyboard was trying trying to force a foreign language upon me. Once I had installed Swiftkey and configured the settings all of the buttons on the keyboard worked and once the connection had established it worked a lot better. For most people I doubt they would spot these slight issues. Just me and my over complicated user names and passwords. Installing big games or lots of simultaneous app updates is a bit painful because of the wireless b/g rated wifi. I guess the main use for this JoyTAB is going to be note taking, drafting up documents for tidying up later, Web browsing, emailing, a bit of media playback and a few games. Each of which are easily replicated. Note taking is a doddle these days, you have synced options like EverNote or OneNote or you can use one of the many offline note taking apps. 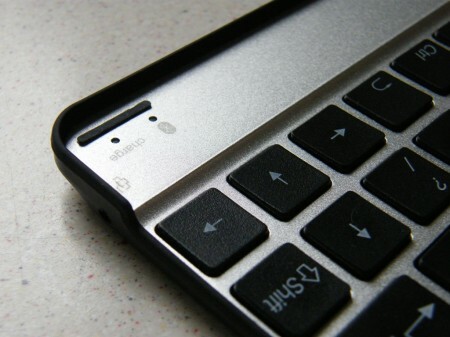 The keyboard really lends itself to basic note taking, taking minutes of a meeting or something like that would be easy. Most of these apps support offline saving so the lack of 3G isn’t a problem. I’ll look at a potential workaround to that in a bit. Creating documents is going to take a little bit of money, a little bit of experimenting or a Web connection. Out of the box there isn’t an Office type app, so your going to have to buy QuickOffice or experiment with the free Office apps on the Play Store until you find one with the features you require. If you have a Web connection you can of course use your Google Drive account to create documents, again having cut, copy and paste buttons is rather useful. 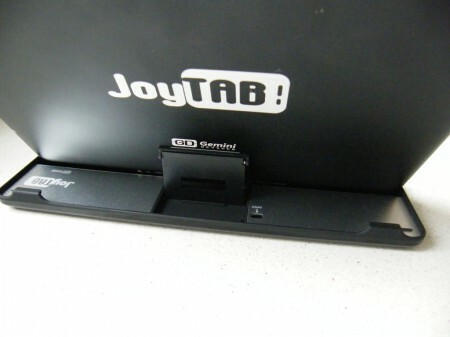 Whichever method you choose the JoyTab and the keyboard will manage easily. For emails the JoyTAB is good as long as you have a Web connection, running ICS means you get the latest tablet version of the Gmail app. 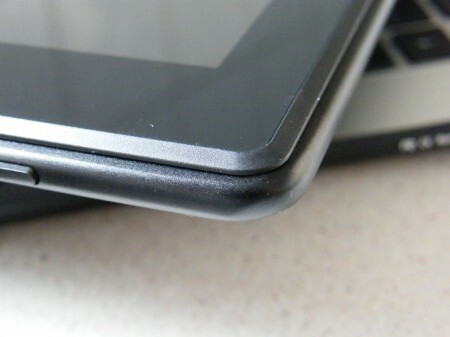 Listening to music on the JoyTAB is a pleasure. 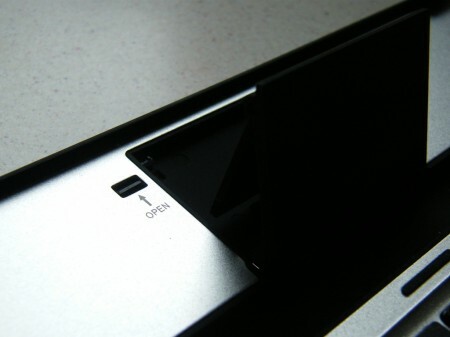 Using either the internal storage or a microSD card you can easily listen to music, the sound quality is quite good and if you’re using the keyboard whilst listening to music then you can use the keyboards media controls. Streaming music via 7digital was also easy to do as long as you have wifi to hand. As the JoyTAB is running Ice Cream Sandwich you get a built in Equalizer as well which helps boost the bass or treble of the music. Watching videos is handy on the JoyTAB as the keyboard case holds up the screen at the right angle, this would be ideal on a train on plane. 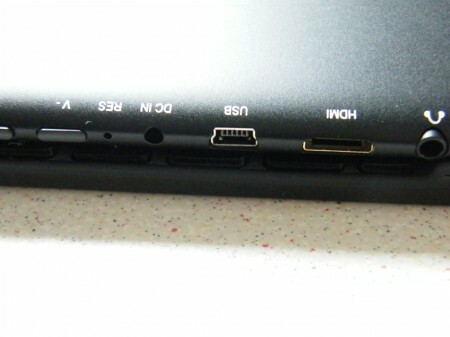 The HDMI out port also makes showing videos or pictures on the big screen easy. Although the 4:3 ratio isn’t really that well supported. YouTube for instance leaves bars at the top and bottom of videos during playback. Web browsing on the nice clear screen was a pleasure and it was made easier as running Ice Cream Sandwich you can access all of your synced bookmarks. The 4:3 ratio made browsing the web a little less zoom and scroll orientated than normal as well. 4:3 always seems to make more sense for web browsing. It would nice if the keyboard had a trackpad on as well for clicking awkward links. 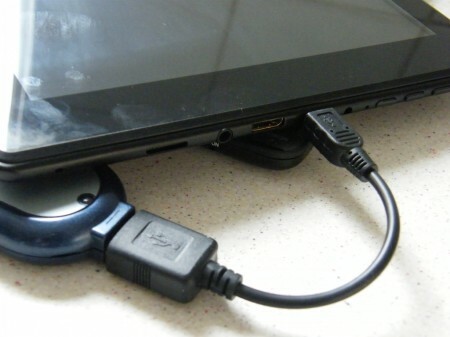 Playing games on the JoyTAB was a pleasure, the big screen lends itself to games, the only slight problem is a lot of games these days are Tegra specific or have hd versions for well known tablets. 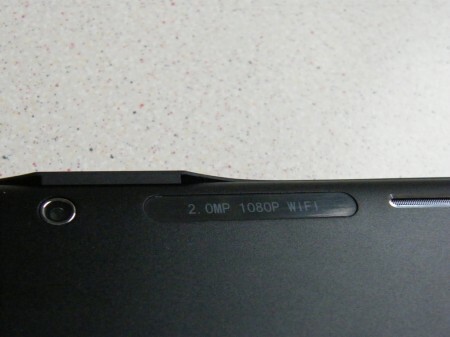 The JoyTAB is obviously not going to work with the latest Tegra 3 specific games. Although I did get a good range of normal games to work perfectly well such as all of the Angry Birds games, Cut the Rope, Where’s my Water?, Jewels, Dead Trigger and a whole load more. Again the ratio and resolution caused a few problems with a few games not scaling properly to the resolution. This is just the games developers not making their game for the 4:3 type device. The lack of 3G bugged me from the outset of my time with the JoyTAB. Much in the same way it does with my Transformer. Luckily I have a Mifi, which allowed me to create wifi wherever I was, as long as there was a 3G signal present. At first it had issues running wifi and bluetooth together, but after a quick reboot of all items involved we were good. It allowed to email whilst I was out and about. 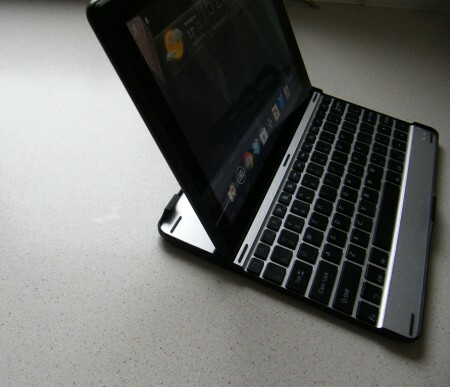 Overall the JoyTAB GEM10312BK is a great device for the price the wide range of connectivity options, the stage space, the keyboard case and the price make it an ideal device to have round the house, to take on the road, to take on holiday with you or even to work with. 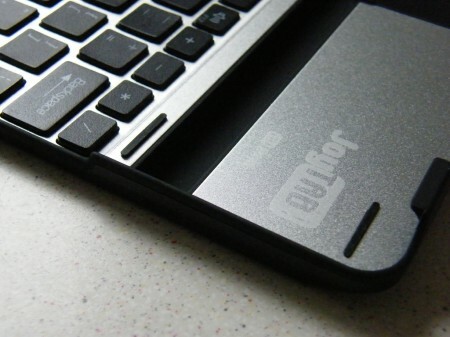 Yes there are similar devices coming in cheaper but the keyboard case is a nice addition to the set. 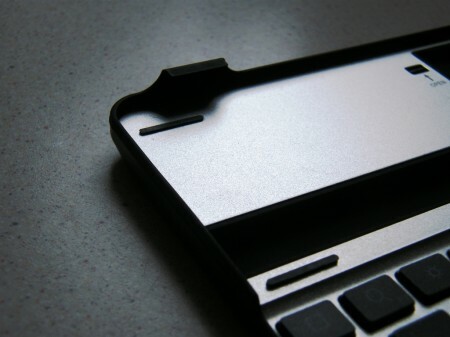 Allowing you to protect and enhance the usability of the device. 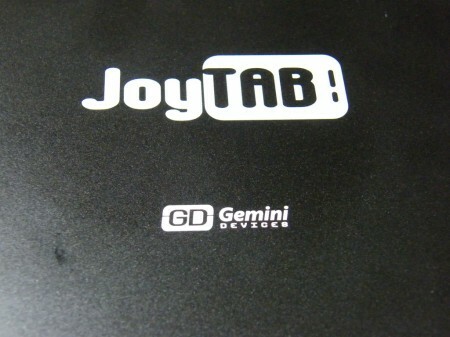 At the moment the JoyTAB GEM10312BK is available from a variety of places (details here) for about £200. As an alternative you could consider the similarly priced, but more compact Acer Iconia A110, which is available as one of buy now pay later portable computers at the BrightHouse electronics store.